By their own admission, Extreme play "Funky metal" and it's hard to disagree, but to that add a way with a melody and well crafted vocals and you begin to understand their appeal. With over 10 million albums sold worldwide their popularity was at its peak in the early 1990s when their single, 'More Than Words' topped the Billboard singles chart and No.2 on the British chart. Both 'More Than Words' and the Follow-up big hit, 'Hole Hearted' came from the album,'Pornograffitti'. This 1990 album ultimately spent 75 weeks on the American album chart and reached No.10 in the process, in Britain it just failed to make the top 10 but spent over a year on the charts. Their 1992 third album reached the exact same position on the US album charts, however, III sides to Every Story', made No.2 on the British charts. The Massachusetts-based band formed in 1985; guitarist Nuno Bettencourt had already played in a local band with bassist Pat Badger, while singer Gary Cherone fronted his own group with drummer Paul Geary. The two bands eventually merged, and Cherone and Bettencourt formed a songwriting partnership that would soon place Extreme atop the Billboard charts, if only for a short period. Coupling the technical proficiency of Bettencourt's guitar with a funky rhythmic base, the band issued a self-titled debut album in 1989. It peaked at number 80 -- a modest showing for a new, unseasoned band -- and the song "Play with Me" was used to orchestrate the chase scene during Bill & Ted's Excellent Adventure. 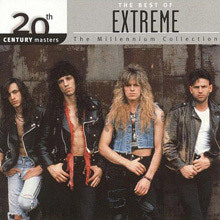 Extreme had begun to earn respect in the heavy metal world, but it wasn't until the arrival of the band's follow-up effort, Pornograffitti (particularly the the Everly Brothers-style acoustic ballad "More Than Words"), that a mainstream audience latched onto the group's sound. "More Than Words" became a number one hit, while its follow-up single, an acoustic-based pop/rocker named "Hole Hearted," hit number four. 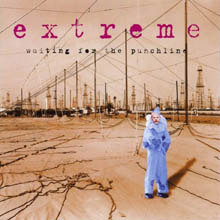 Extreme were now one of the most popular acts in the pop-metal genre, but the looming arrival of grunge music -- not to mention the band's own shifting tastes -- combined to make Extreme's reign relatively short-lived. The band's third album, III Sides to Every Story, was an ambitious effort whose sales (while strong at first) couldn't match those of Pornograffitti. Geary left the lineup soon after, seeking a career in music business instead, and a revised version of the band (featuring the percussion of Mike Mangini, formerly of Annihilator) returned in 1995 with Waiting for the Punchline. It, too, suffered from a lack of sales. 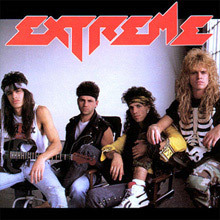 Accordingly, Extreme's bandmates announced their breakup the following year. Bettencourt went on to launch a solo career and issued the Schizophonic album in 1997; he then released two additional albums with his band Mourning Widows. Meanwhile, Cherone enjoyed a brief stint as the vocalist for Van Halen. His one album with the band, 1998's Van Halen III, was slammed by critics and fans alike, resulting in poor sales and Cherone's speedy exit. A 13-track best-of collection named An Accidental Collision of Atoms kept Extreme's legacy alive in 2000, and the band quietly reunited in 2004 for a small series of shows. The reunion gigs continued into 2008, when a new album, Saudades de Rock, marked the group's first batch of new material in 13 years. 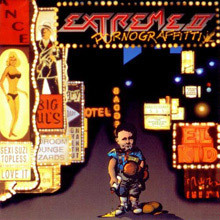 Extreme came into its own on the concept album Pornograffitti, with the band's strongest set of songs and an intellectual theme revolving around the struggle for genuine love and romance in a sleazy, decadent society full of greed and corruption. The band shows a strong desire to experiment and push the boundaries of the pop-metal format, adding a funky horn section on "Get the Funk Out" and displaying progressive compositional leanings throughout, and virtuoso Nuno Bettencourt puts down his guitar for the enjoyable pseudo-lounge piano ballad of "When I First Kissed You." But of course, the album is best known for its two acoustic-guitar-only hits, the number one ballad "More Than Words" and the equally fine full-band rocker "Hole Hearted." Other highlights include "Decadence Dance" and "Song for Love." Their debut album released on 14 March 14 1989 included four singles: ‘Little Girls’, ‘Kid Ego’, ‘Mutha (Don't Wanna Go to School Today)’ and the radio-only ‘Play with Me’. All of which gathered fans around the band that helped launch their follow-up album, Pornograffitti that became a big hit. 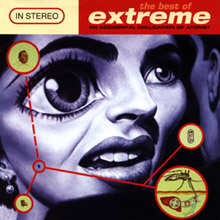 Extreme's fourth album, which was released in 1995 and is a much rawer record than the two previous, big production, albums. With a significant influence from grunge and alternative rock, it still showcases guitarist Nuno Bettencourt's talents. It's also the only record to feature drummer Mike Mangini (on 3 tracks). After the album's tour, the band disbanded in 1996 when Bettencourt informed Extreme that he was leaving the band to pursue a solo career. After the breakup, singer Gary Cherone also joined Van Halen in the same year as their new singer. 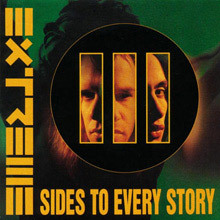 Extreme's brand of hard rock balanced ambitious, progressive tendencies with catchy melodies owing more to the Beatles than anthemic arena rock; on III Sides to Every Story, the former tends to dominate. The album is divided into three "sides of the story" -- roughly speaking, "Yours" concentrates on politically oriented rockers showing off Nuno Bettencourt's virtuosity; "Mine" leans toward pop songs with warmly romantic sensibilities, plus an occasional philosophical lament; and "The Truth" tries to wrap things up into a coherent whole but dissolves into indigestible prog-rock excess. Thus, the thematic material can be likened to a less focused version of Pornograffitti. The album is wildly uneven, but amidst the indulgences there are some fine songs to be found: "Rest in Peace" displays both Bettencourt's technique and melodicism as a soloist, while "Seven Sundays" continues in their occasional lounge ballad vein, and "Tragic Comic" and "Stop the World" are two more intelligent, wounded-romantic pop gems. There is a full-priced, 13-track Extreme compilation released overseas under the title An Accidental Collision of Atoms and in the U.S. as An Accidental Collocation of Atoms (wordplay always being a favorite pastime of the band); this edition of Universal's 20th Century Masters - The Millennium Collection series of midline-priced best-ofs offers a similar selection, but it shaves off three lesser-known album tracks and re-sequences the remaining ten, leaving all nine of the recordings Extreme placed in Billboard's Album Rock Tracks chart between 1989 and 1995, including, of course, its top five Hot 100 hits "More Than Words" and "Hole Hearted." You get a good sense of this well-named group from the selection; it was a band that went to extremes, whether pursuing heavy metal in songs like "Kid Ego" or acoustic balladry in "More Than Words," waxing political in "Rest in Peace" or adopting a Beatles-like prog rock complexity in "Stop the World." Ultimately, those extremes may have been more than a mass audience or even a cult audience was willing to bear. To some listeners, An Accidental Collocation of Atoms? may not seem necessary, since Extreme's two hits were already on one album, yet for casual fans who don't have Pornograffitti, or want highlights from the other records, this is a strong, representative collection. Sure, dedicated fans will find some favorites missing -- after all, these are pulled from records that were designed as albums -- but all the singles are here, including such European releases as "Get the Funk Out" and "Tragic Comic," along with such strong album tracks as "Decadence Dance." There's only one semi-rarity to snag the faithful -- the "Horn Mix" of "Cupid's Dead" -- but these fans are likely to stick with the original albums, no matter what. And, truth be told, there's some relevance in that, since the albums were cohesive works, but An Accidental Collision of Atoms remains a first-rate sampler that proves Extreme were better than the vast majority of their Bush-era hard-rock and pop-metal peers.